Hair goes gray eventually, and there is nothing you can do to stop it. The time of your life when your hair will go gray depends on several factors. Most people dread going gray because gray hair is associated with age, and nobody likes to be reminded that we are all growing old. Unfortunately, some people are affected by premature hair graying, i.e., the hair goes gray way before what would be considered normal. Any graying of hair that occurs before 35 years of age is considered premature hair graying. Premature hair graying can affect children, teens and adults equally. There is one very obvious symptom of premature hair graying – your hair goes gray. You may see only a strand or two of gray hair at first, but the numbers will increase as time goes by. The first strands of gray hair will appear along the temple. It will gradually spread to the crown, and finally cover the back of the head. The graying hair is usually coarse and dry. Premature hair graying is characterised by brittle hair that breaks easily. Sometimes, premature hair graying can lead to hair fall as well. Premature hair graying is primarily caused by a reduction of melanocytes in the bulbs of the hair follicles. Melanocytes are pigments that give your hair colour, similar to how melanin is responsible for the colour of your skin. Over-production of melanin makes skin darker. Less melanin equals fairer skin. In the case of premature hair graying, melanocytes play the same role as melanin. Premature hair graying happens naturally with age. The body produces less melanocytes as you get older, which is why your hair goes gray. There are many factors which can reduce the amount of melanocytes prematurely, thus causing premature hair graying. Hormonal changes greatly contribute to the condition of your skin and hair. Any major hormonal changes – such as the kind the body goes through during pregnancy – can cause premature hair graying. Thyroid disorders such as Grave’s disease, hypothyroidism and hyperthyroidism fall into the category of hormonal imbalances that cause premature hair graying. Lack of nutrition is another major cause of premature hair graying. When your body does not receive enough nutrition, it will use the vitamins and nutrients it receives to run only the vital systems of your body. The health of your hair is not crucial to survival, so when you don’t eat properly, your body’s internal hair care system will shut down and you can suffer from premature hair graying. A deficiency of vitamin B-12, iron and iodine in particular is known to cause premature hair graying. Stress is another major cause of premature hair graying. If you have been undergoing a difficult phase in your life or are over-working, it can cause your hair to go gray before its time. In fact, the ancient texts of Ayurveda as well as Chinese medicine point to emotional disturbance as the primary cause of premature graying hair. Shock, sorrow, anxiety can all reduce the amount of melanocytes being produced, thus leading to premature graying hair. Chinese medicine states that premature graying hair is a reflection of unhealthy blood and kidneys. This hypothesis has not undergone scientific scrutiny. However, many of the medications available to treat premature hair graying have active ingredients which directly take care of the kidneys and/or blood. So there may be some truth to this theory. Of course, sometimes premature hair is graying is simply in your genes. If your parents or grandparents had premature hair graying, it is very likely that you will too. Some health conditions can lead to premature graying hair. For example, a medical problem known as vitiligio causes your skin to lose melanocytes, which can lead to premature hair graying. An unclean scalp due to insufficient hygiene may be another cause for premature hair graying. If you do not take good care of your hair, it will go gray. Although they are not sure why, researchers have found a link between smoking and premature hair graying. Women who suffer from early menopause can find that they are suffering from premature hair graying in addition to their other menopause symptoms. Some researchers feel that premature hair graying may also be caused by using very hot water to wash hair, and frequently resorting to a blow dryer instead of letting hair dry naturally. From the list of premature hair graying causes listed above, you can determine which factors are within your control and which aren’t. Your treatment plan for premature hair graying will largely depend on what is in your hands. If there is an underlying cause for your premature hair graying which you can directly tackle, then that’s great news because it means that you can possibly reverse your premature hair graying. If not, then you just have to learn to deal with premature hair graying. There are several commercial products which claim to be able to cure premature hair graying. Their efficacy may differ from person to person. Be wary when investing in such products as they are usually designed simply to profit from our insecurities. Take vitamin and mineral supplements so that your body has the nutrition it needs to prevent premature hair graying. Improve your diet. No point in popping multi-vitamins or eating healthy foods if you are going to be eating a similar amount of junk food as well. Cut back or eliminate completely baked goods, fired foods, processed foods, fast food, sweets, and caffeine. Learning to better manage your stress is one of the best ways to treat premature hair graying. Most cases of premature hair graying are caused by stress related to work and family pressures as well as self-expectations. By reducing your stress, you will probably be able to reverse your premature hair graying altogether. Avoid blow drying hair or washing in very hot water. Lukewarm temperature is best for hair and skin. Keep blow drying to a minimum, no more than once a week. Avoid it completely if possible. 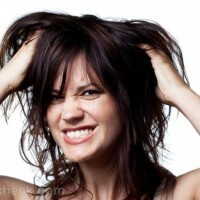 Use a mild shampoo and conditioner, something with natural ingredients instead of chemical-based hair cleaning products. Learn how to take care of your hair depending on your hair type. You may need more or less washing than what you do now. Perhaps you need to take special measures for your hair type. In case your premature graying hair is caused by pregnancy, you need not take any measures to reverse it as your hair will go back to normal within a few months of giving birth. If the cause for your premature hair graying is genetic, there is nothing you can do about it. Usually, treating premature hair graying has more to do with your individual efforts than any medication. There are several simple things you can do at home to prevent hair from getting gray fast. Some of these home remedies for premature hair graying may even stop graying hair permanently or reverse your premature hair graying. You can rub amla paste into your hair to reverse premature hair graying. Many folks swear that this will work wonders for anyone suffering from graying hair prematurely. Several aver that it can totally reverse premature hair graying. Try massaging the scalp with almond oil. Another good massaging oil to treat premature graying hair is coconut oil mixed with freshly squeezed lemon juice. Massage for at least 15 minutes a day everyday until you see results. You can then reduce it to twice a week. Those who have used this method to check premature graying hair state that it reaps almost miraculous benefits. Make a cup of strong tea without milk. Add two tea spoons of salt. After the tea has gotten cold, massage into the roots of your hair. Leave on for an hour, then rinse off with cold water. There is no need to shampoo after this. In fact, it works better for premature graying hair if you do not shampoo. Strange as it may sound, butter can be used to treat premature graying hair. Simply massage a small amount into the roots for about 15 minutes and then wash off. Do this about twice a week. Sometimes, there may be nothing you can do about your premature hair graying apart from accepting it and finding ways to work with it. For example, you can dye the rest of your hair gray too and make a bold and shocking fashion statement. If that is too extreme a step for you, you can always colour your hair. You don’t even have to stick with your natural hair colour as you now have a range of exciting hair colour options to choose from. Since nutrition plays a role in the texture and overall condition of your skin and hair, you have to make a conscious effort to fine-tune your meal plan to include food items that help you treat a particular problem. Following are some of the foods that you should be eating regularly to help you treat premature hair graying faster. Protein has to be an essential part of your diet if you want healthy hair. Foods that are abundant in protein include soy, cereals, whole grains and meat. Dark green and leafy vegetables should anyway be a part of your regular diet, but even more so if you want to prevent or treat premature hair graying. These foods have vitamin A, vitamin B, and iron, all of which are necessary for healthy skin and hair. Yoghurt, bananas, cauliflower, tomatoes and cereals contain vitamin B – an important vitamin that you want to get enough of if you want to prevent or treat premature hair graying. Vitamin B is responsible for regulating oil secretion in your skin and scalp. It also acts as a natural internal moisturizer for your hair. Non-vegetarians should eat chicken or beef for iron, red meat for vitamin B 12 and zinc, and seafood and eggs for copper. These minerals are just as important in treating premature hair graying as vitamins. Fruits and veggies that are yellow or orange in colour are also highly recommended for those with premature hair graying. The colours are in fact a sign that the fruit or vegetable in question has vitamin A and C – both crucial in bettering the health of your hair.